And one day it dawns on you, do I even need a car? The Townie Commute offers the comfort of the best-selling Townie with a few upgrades that will allow you to go the distance in comfort and style. If youre thinking about getting around on two wheels more often, this is the bike for you. Large 700c, puncture-resistant Schwalbe balloon tires roll fast and smooth, decreasing vibration on uneven roads. Swept back handlebars provide a comfy, upright position with a wide view of the road so you can spot potential hazards, opportunities and detours. And by detours we mean happy hours. 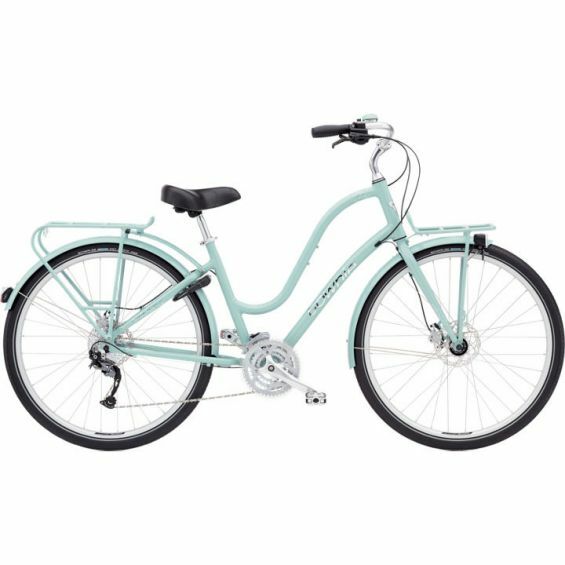 Electra then added heavy-duty front and rear racks to carry your bags and color-matched fenders to keep you clean. Lastly, front and rear LED lights keep you safe on the ride home. And you know itll be a comfortable ride, because it wouldnt be a Townie without our patented Flat Foot Technology. So get on and ride like the wind. Dont worry, your car will be just fine in the garage.